The rocks selected for this unusual arrangement are imported and washed in acid, making them strikingly unique. We then cut and cement the rocks to one side of the pot and create a well on the opposite side. A ceramic bridge is cemented to the rocks on either side. A pagoda figurine is also added and cemented to the stone located above the bridge. To complete the scene, we cement a miniature, glazed, mud figurine fisherman overlooking the well, holding a fishing pole and fish. On the opposite side of the restful scene, we have selected for planting, the flowering Mount Fuji Serissa. 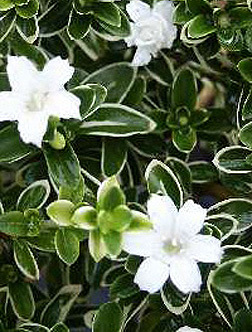 Beautiful white, star-shaped, miniature flowers. 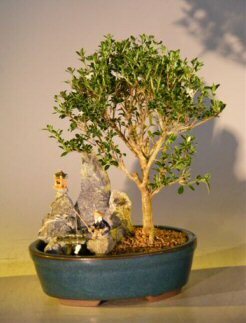 This sub-tropical variegated evergreen, which is imported from Japan, can bloom profusely with delicate white miniature flowers. Loves direct sunlight. Potted in an 8" oval container as shown. Suitable humidity/drip tray is recommended. To purchase add $7.95.